(NW) of this blog serves me a "blind" sample of a red wine. We do this to sharpen each others sensitivities and attention to detail when reviewing wines with each other. My notes--Hue--showing considerable age yet with life, bricking at the rim. Bouquet--is absolutely lovely and lively with a subtle raisiny/pruney foundation reminiscent of a nice Amarone. There are wonderful waftings of fragrant and sweet dill and caraway (rye bread) topped by cigar box aromas and powdered milk chocolate. Palate--Stunningly silky mouth feel with plush integrated flavors of creamy stewed black fruit, currant, ripe mushy raisins. There are still the makings for a wine of age with tannins and acid to hold. Creamy fruit and cherry finish. Stunning! I exclaimed to (NW) "This is why we drink wine!" He just smirked. So it was time to give him my assessment. I said--"This is a wine of 15-20 years, perhaps an Amarone, Barolo or nice Super Tuscan. 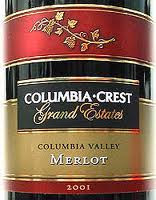 He unveiled the bottle showing a 2001 Columbia Crest "Grand Estates" Merlot which costs around $11. He knew I wasn't buying it so he laughed and pretended to get the real bottle. But alas--it WAS the REAL bottle. I am still waiting for him to contact me and tell me he was just kidding but I don't believe he was. This wine was phenomenal. How could such a seasoned expert with over 30 years of experience be so WRONG? It is simple--to be a great wine identifier, you have to have tasted the wines you are trying to ID blind. How many of us "lay down" the easy drinking wines like Columbia Crest when they drink so well out of the gate? So the fact is, I have not had many (meaning less than 3 (if that) probably) of domestic, inexpensive but well made Merlots that are 10 years old. With no reference point, the grape didn't taste like Merlot and the wine didn't taste like a table wine. The moral of the story? There are companies out there which actually make really good, yet inexpensive wines for every day consumption at the $10-$15 price point but are never allowed to reach their potential. The Columbia Crest "Grand Estates" line are one such wine. So if you have a few laying around, put some age on them and then sit back and get ready to raise a glass and be stunned!